See last paragraph of the image. Endler, J. A. 1986. Natural Selection in the Wild. Princeton University Press. I’m wondering in which case it’s possible that everything is in place for natural selection to occur, but is not having any effect. It seems to me that if every condition of natural selection are met, there will absolutely a change in the phenotypic distribution? Why does the text say evolution is not guaranteed to occur? As a result of this process, but not necessarily, the trait distribution may change in a predictable way. To my understanding, but not necessarily means that other processes than natural selection can affect the trait distribution in a predictable way. 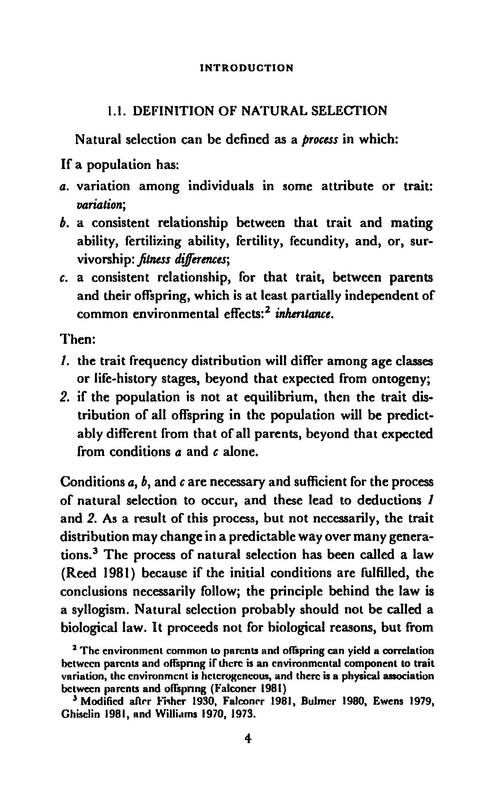 Other than natural selection, what affects the trait distribution in a predictable way? I am not trying to make an exhaustive list but I am just providing here two obvious examples. An intense gene flow (migration) from a nearby population will also cause the trait distribution in a local population to change in a predictable way. Genetic drift, will reduce genetic variance and therefore reduce the variance of the trait distribution. While the change of the mean of the trait distribution is not predictable under genetic drift, its change in variance is predictable. Note that the book has been published in 1986 and the vocabulary and science is probably slightly outdated. If you are learning about evolutionary biology, you can probably find better source of knowledge. For example Understanding Evolution is a free online introduction to evolutionary biology. There are many textbooks that offer very good introductions to evolutionary biology. Genetic drift is the random loss of genetic variance from the population by stochastic processes. Mutation (generally) generates new genetic variation within populations. Migration can lead to loss (emigration) or gain (immigration) of genetic variation from a population, as variants come or go from a population. Selection is mechanism underlying adaptation. This is what is in condition b of the conditions you gave. We can predict the response to selection using some simple quantitative genetics in the form of the (multivariate) breeders equation. Where $\Delta z$ is the response in the trait, $G$ is the genetic (co)variance matrix, and $\beta$ is the selection. Mutation, drift, and migration could all oppose or distort the effect of selection. In other words, they can cause the actual and predicted response to be different from one another (i.e. $\Delta z_i \neq 0.4$), and there will not necessarily be a change in the phenotypic distribution. This is a major issue in the study of evolutionary biology. Genetic correlations can cause severe disparity between the actual and predicted response to selection and univariate methods are insufficient as a result. More studies adopt multivariate methods these days, though these are generally limited to just a handful of traits so its still not perfect. In reality methodological and logistical constraints present a huge obstacle to being able to predict $\Delta z_i$. Are humans evolving since their first appearance? Why would stablising selection ever happen? Has it been enough time for evolution through simple natural selection? How can natural selection occur at species level whilst not occuring at the individual level? Is natural selection a force? Does natural selection select for randomness in development?